NEW! 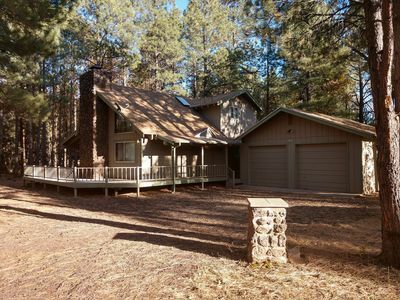 'Love Cabin Hideaway' Inviting 2BR Pinetop Cabin! 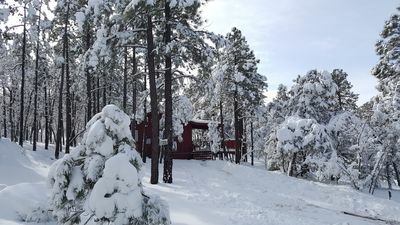 Escape to a mountain-home sanctuary and leave the world behind at this 2-bedroom, 2-bathroom Pinetop vacation rental cabin that sleeps 6. 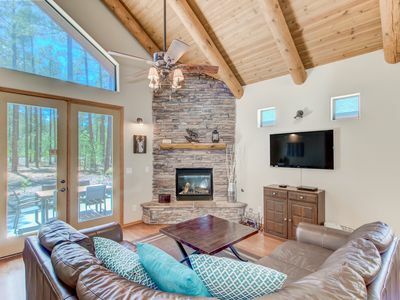 This recently renovated, redwood-cottage style cabin offers a comfortable 1,400-square-foot living space, custom decor with a natural motif and a new front deck with patio furniture and a gas grill. Enjoy all the modern comforts of home and explore the surrounding forest during your next getaway adventure! 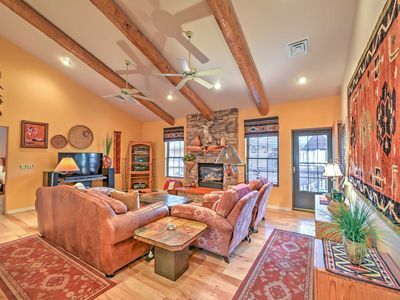 A high, wood tongue and groove ceiling, original artwork and a charming fireplace highlighted by a custom burned-log mantle welcome you upon entering this Pinetop cabin destination. 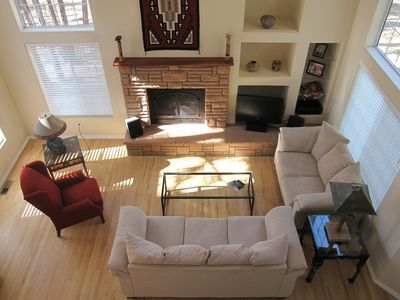 The living room provides lamps made from the same burned-log as the fireplace mantle, a comfortable queen sofa sleeper, matching loveseat and a reclining armchair. Move freely to the inviting dining table and sit down with your travel companions to share memorable dining experiences. The dining room opens into the spacious, fully equipped kitchen, featuring a 4-burner electric stovetop and beautiful 42-inch Alder wood cabinets. Enjoy whipping up tasty goods for any meal of the day! You’ll also find an additional office study room in the cabin, where you can curl up with a new book during your vacation downtime. Step outside on sunny days and fire up the gas grill to have an afternoon barbecue. Sip on your favorite drinks underneath the shade umbrella, relax and listen to the birds sings. 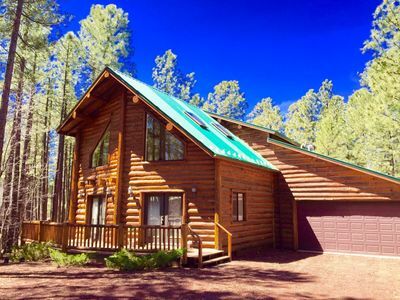 Head out for an evening walk among the surrounding pine, oak, and aspen trees, then return to the cabin and drift off to peaceful slumbers when you’re ready to call it a night. The master bedroom boasts a queen-sized bed and a pristine en suite bathroom, where you can soak in the bathtub to prepare for your next adventure! 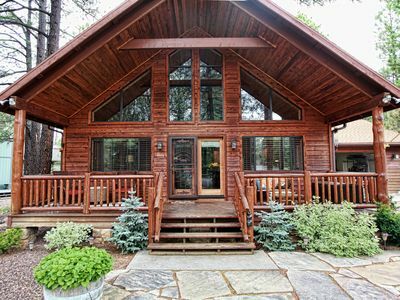 This mountain-cabin home offers a great location to explore opportunities for outdoor recreation, with easy access to local amenities. 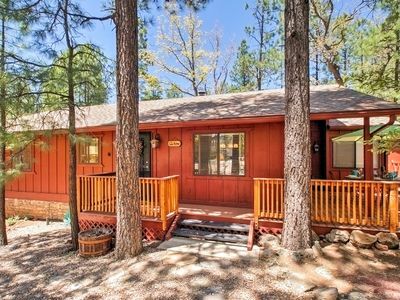 In the surrounding Pinetop and Lakeside areas, you’ll find a variety of sites offering different outdoor activities, including camping, hiking, mountain biking, kayaking and fishing. 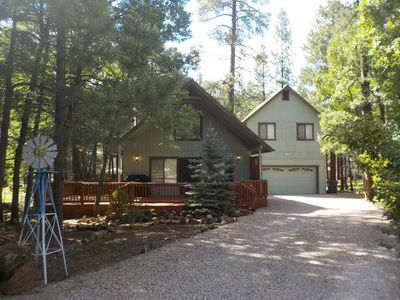 Within 1 mile from the property, you’ll have access to both the White Mountain Country Club and Pinetop Lakes Country Clubs. Pack your golfing equipment and fine-tune your game on these world-class courses. 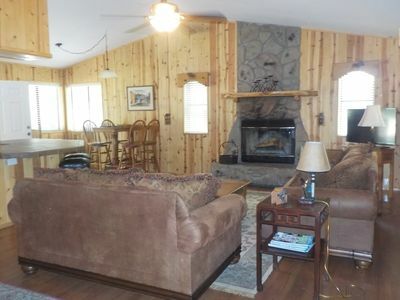 The White Mountain lakes, streams and rivers, and the Sunrise Ski Resort are all within an hour drive from the cabin. 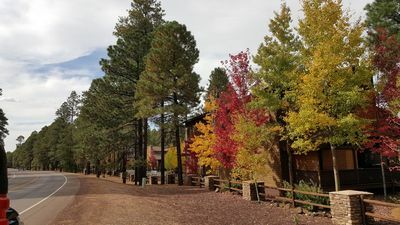 You’re about a mile from many popular restaurants in the town of Pinetop, including Los Corrales and The Lion’s Den Bar & Grill. Check out the public library, see a movie at WME Village 8 and treat yourself to a night out to finish your vacation. 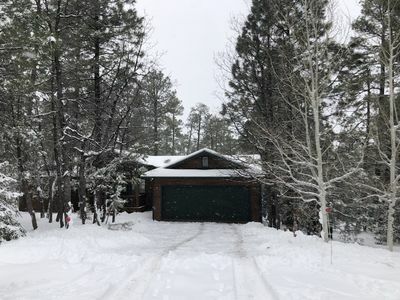 - Great Pinetop location - Nestled in a pine, aspen and oak filled part of the forest, with easy access to outdoor recreation and local amenities! 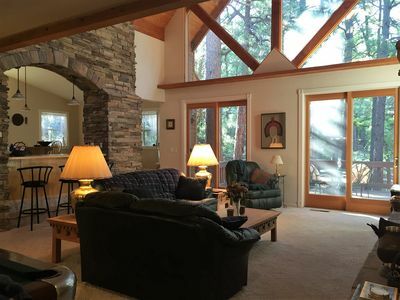 Chalet Style Home In Beautiful White Mtns. 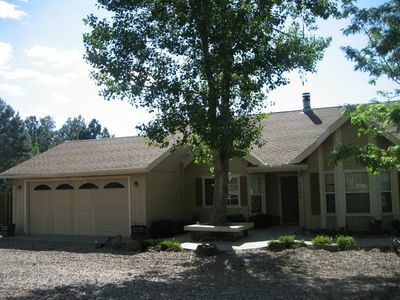 Pet-Family Friendly, Great Location! 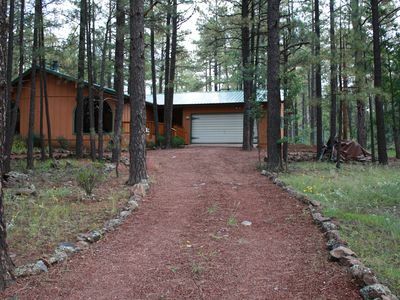 Beautiful Custom Cabin in Pinetop CC 3 BR, 2 Lofts, 3-1/2 BA, 35' Deck, Private!